Scout Nights are held from October through May. Click here for 2018-2019 Scout Night sessions! Come to the Wisconsin Humane Society Milwaukee Campus to work on your Dog Care Merit Badge and have a howlin’ good time in the process! Meet some sensational dogs, learn first aid basics, get the scoop on animal care and the basics of dog training, and more. Upon completion of the clinic, scouts will be able to sign off on eight of ten requirements of the Dog Care Merit Badge. Of the ten requirements for this badge, eight can be signed off on the day of the clinic. Due to the nature of requirements #4 and #5, they must be completed on your own. If you do these prior to the workshop and bring your documentation with you to the clinic, we can sign off on everything that day and you are done! If you complete the requirements after the clinic, you can coordinate with the Merit Badge Counselor to get your blue card signed. Although you are not required to have a dog to attend this workshop, a dog is required to complete requirement #4 and #5. 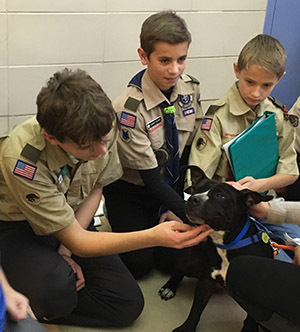 Boy Scouts who are considering adopting a dog may want to attend to find out more about the responsibilities and care dogs require. You can attend the workshop and complete the requirements when you add a canine family member to your pack. You can also borrow a friend, neighbor, or family member’s dog for these requirements. 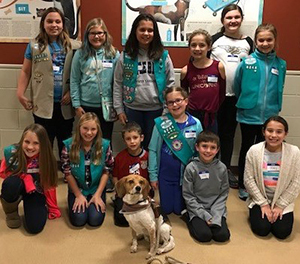 2018-19 Dog Care Merit Badge Clinics are offered on the following Sundays from 1:00 - 5:00 p.m. 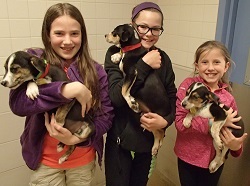 Interested in helping homeless animals as part of a scout project? Consider organizing a donation drive prior to visiting us by collecting cat and dog toys, peanut butter, treats, and/or new or gently used towels and blankets to help the animals at the Wisconsin Humane Society. To find out more on how you can make a difference, visit Kids Can Help.